At the University of Bolton, Ben Ward, founder of Supergonk, recently visited to give us a talk on ‘building a games studio’. In the talk, he discussed his career in the games industry and how he created his very own game studio named Supergonk. Many interesting points were mentioned in the talk, but one that interested me the most was ‘what to expect going indie’. As ben mentioned, starting your very own indie company can be ‘dangerous’ as there are risks to be taken into consideration. Funding would be a great example of this as not all games sell as well as you think. In (Woodrow, 2014) online blog titled ‘7 truths about indie game development’, she talks about how each game is a gamble and that a huge amount of why any game is successful is down to luck. This could be down to the amount of games released a day. According to (Graft, 2015) online blog titled ‘500 games launched per day on iOS last year (and other digital sales facts)’, on the iOS alone, around 500 games are launched daily in 2014, and 250 a day on Android. This goes to show that getting that publicity is hard as you are up against other games. This leads to thinking of ways to combat this as a company to get your game noticed by gamers. Over the years, ways to publish games has increasingly become easier as we have now been introduced to digital distribution such as Steam (PC), PlayStation Store (PS4), Xbox Store (Xbox One) and many more. Another great way, which Ben Ward was able to make use of, is to get a hold of publishing companies, such as Apple, and tell them about your game in order to get a featured spot on the App Store. (Rousvoal, 2014) online blog titled ‘Promoting your indie game on social networks’, outlines a very nice point about this, which says that social media marketing is low cost that can gain you visibility. This is both great for a low budget game and can gather more attention to your game from a specific demographics with certain techniques. Crowdfunding sites have become a big hit with today’s game developers. The well-known ones being Kickstarter, Indiegogo and Crowdfunder. These are platforms where developers post their prototypes and users can decide how much they want to donate to the project. Not always does this work though as the project you posted might not get the attention you are looking for. As (Theysen, 2015) online blog titled ‘The #1 problem for Kickstarters today’, he mentions that there are so many newly released games that not all of them are going to get ‘attention’ or ‘proper coverage’. However, he then goes on to mentioning to ‘seek help elsewhere’. Contacting the press, using social media or contacting other developers could be useful for this as this can help gain that coverage for the game in which you are developing. To conclude, going indie has some risky elements to it. Funding is the biggest risk as you need the money to be able to fund staff or to pay the bills. However, if you’ve had experience in an AAA company or a successful indie company, you will be able to see how they organize their projects and take it to your very own company. From this, you might even gain attraction from publishers meaning you might be funded by them to make some games. Ben Ward mentioned that it’s ‘dangerous but really fun to do’. So if you go into it, be sure to have knowledge beforehand. Woodrow, S., 2014. 7 truths about indie game development. [Online]. Graft, K., 2015. 500 games launched per day on iOS last year (and other digital sales facts). [Online]. Rousvoal, Y., 2014. Promoting your indie game on social networks. [Online]. Theysen, J., 2015. The #1 problem for Kickstarters today. [Online]. Statista, 2016. 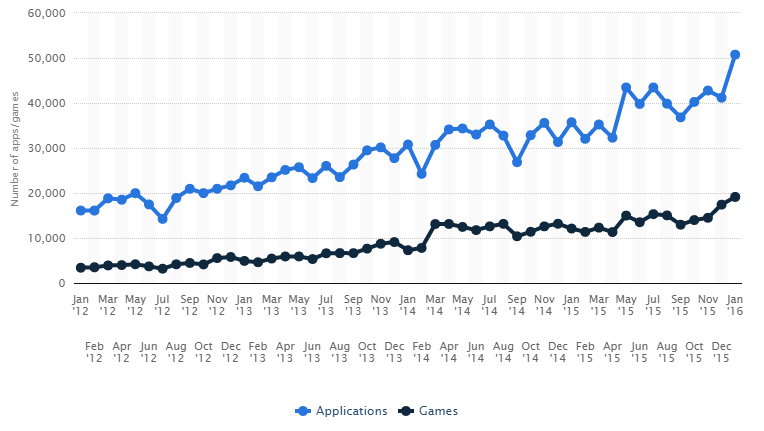 Number of newly developed applications/games submitted for release to the iTunes App Store from 2012 to 2016. [Online]. Evol, C., 2014. StubHub Featured!. [Online image]. GIJN, 2015. Crowdfunding for Journalists. [Online image].